At first glance, nothing looks too different, right? But, scroll down just a bit, and what you find is a split-level approach to displaying the various gadgets/content housed here on Tribecards. I think I am going to play with font sizes a little to help keep the focus on the main posts, but this is much more along the lines I was originally thinking. Oh, I know, most of you could care less what I'm doing with the layout of my blog. I appreciate you putting up with my shenanigans anyway. A while ago, I participated in my first group break, as some of you may remember. As a result of that break, Max got in touch with me regarding the Niese auto/patch card (refresh your memory here, if you need/want to). 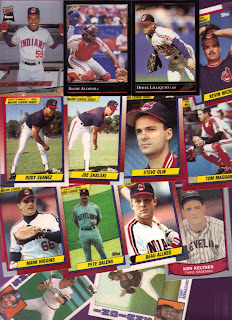 In exchange for the Niese, Max would send me a smattering of Tribe cards. In his words, "a quantity for quality" trade. Well, I threw in a few 'extras' for good measure, and I am afraid I fell a wee bit short. 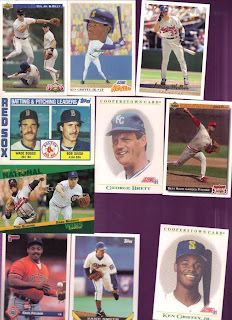 The cards Max sent me cover decades, brands and types. And finally, he lets me know that, "the third one is stuff in top loaders from the wantlist:"
Holy freakin cow! 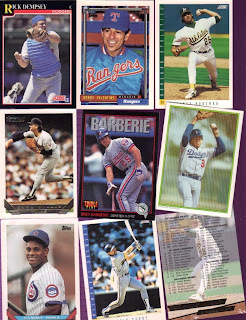 Not only are there some very cool cards throughout this package, but I will have a lot of fun doing the research to determine the year/brand of some of the oddball items to boot. 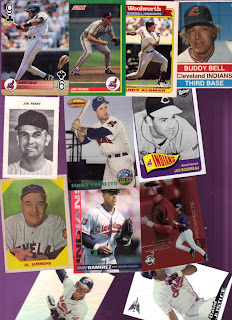 Thank you VERY much, Max, for a GREAT selection of Indians cards! 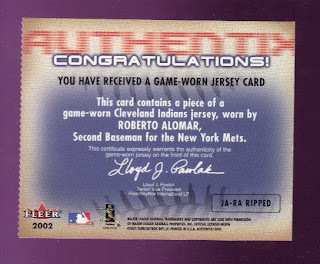 I hope you're happy with the auto-patch card (plus the extras) and feel you got a good deal in the trade! I received a very cool package in the mail the other day from BaseballDad! 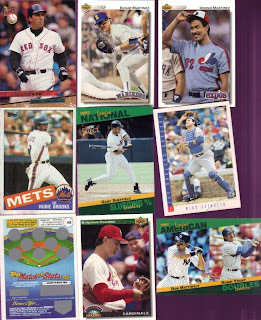 In it, I found a CD with classic baseball-themed songs and bits (including the one featuring the title of this post!!). 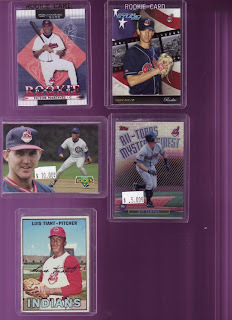 In addition to the CD, I found all sorts of Indians goodies! A "Batter Up" official program guide, several cards including a JustMinors Grady-freakin Sizemore!, and a Sportflics mini team jersey card! 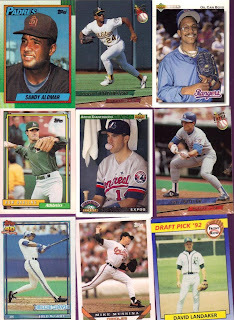 Also in there, CC Sabathia, Mike Hargrove, Jose Mesa and a '96 Fleer logo card from the Indians 20-card subset. Inside the "Batter Up!" 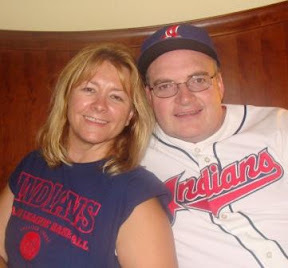 I found a 1/2-off coupon for upper deck box seats to certain Indians games (oh, how I wish!!) and also a 2009 season schedule. What a great surprise!! I know my son will grow weary of the CD before long, but I plan to haul that puppy around in my truck for some time to come. Thanks to BaseballDad for creating new memories and bringing back old ones! I suppose it is rather appropriate that I start working on my "Why I Blog" Bat-around post a day or two AFTER the deadline. It seems many of my posts appear in that fashion - a day or two later than I had hoped. As for me, that's not only par for the course, but also keeps me blogging in the first place. Perhaps I will eventually get back to that, but for now, follow along on a rather bizarre journey into the 'why' I blog (not only on here, but on the myriad of other sites, too). I started 'blogging' back before there was even such a term or even the formalized concept. Back in 1993 or 1994, I had one of those static web pages that my ISP provided for me. I started out with several pages of information that never really seemed to change much. And then I had a thought: Why not update my page as often as possible, preferably daily? That lasted about two days. Frankly, no one was reading my personal page and updating it was an exercise in notepad, FTP, and holding my tongue juuuuust right. Skip ahead a couple years. I was changing ISPs but still wanted some of the content to be saved. I created one of those Tripod pages. The content consisted of Indians-related baseball card information and some random thoughts from the space between my ears. I hated Tripod. That was a pain. And then came Blogger. My original blog (poppedinmyhead) was started because I wanted a place to post all the things I had been storing on Tripod. Mainly, that consisted of a baseball card-related item or two, a list of things college students should know about the Pre-Raphealite Brotherhood, a list of keywords from an old Commodore 64 'game' called "Little Computer People" and whatever else popped in my head (hence the name of the blog). 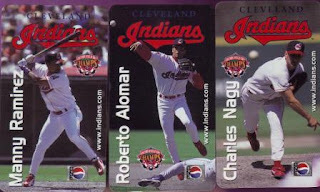 Because I collect Indians cards, I found it hard to find places that just listed Tribe cards. Mainly, I was interested in checklists of the cards I needed, but did not KNOW that I needed. I spent a lot of time searching and searching. 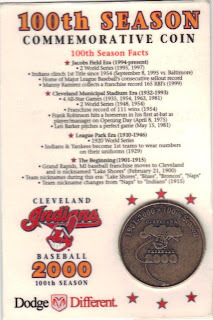 I started "Indians Baseball Cards" because I wanted to provide a place for fellow Indians collectors to get information about the little cardboard rectangles of their favorite team. The very first posts I did were checklists compiled from various sources. And then I strayed. 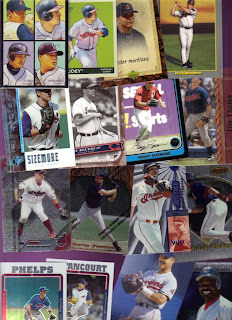 I started blogging anything about the Indians, and then anything about the hobby, and then whatever randomness seemed to fit into my card-collecting habit. So, now that you have a history, let's talk about the meat of it - WHY do I blog about pictures of people on little bits of cardboard? I turned 40 this year. Not a big deal, a lot of people turn 40 (and have already done so many moons ago). Though I am now 40, my brain still sees me as being somewhere between 13 and 25. 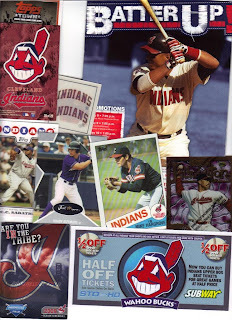 And because my passion for collecting Indians cards never died (though it has waxed and waned throughout the years), I wanted a place that I could write out my thoughts about the hobby I've held on to since I was 5 or 6 years old. I am a writer at heart. I've only had two things 'published' - one in a college literary magazine and the other on a card-collecting online magazine. Nonetheless, I love writing. 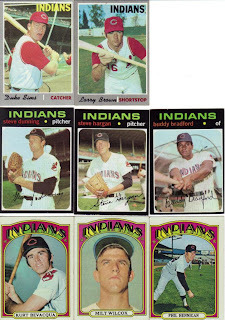 Blogging about Indians baseball cards (or anything related... or not related) gives me a way to take all the thought I have in my head and let them out. And, if I am going to let them out, why not share them with anyone that happens to come along, right? 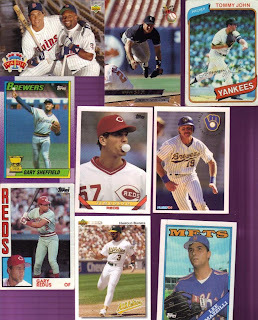 In addition to poppedinmyhead and tribecards, I am a contributing member on "A Pack A Day" and "A Pack To Be Named Later." 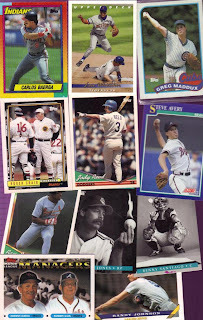 I love blogging on those sites because they allow me to write about cards I would not normally write about on here. Here's the best part of blogging, though: Friends and fellow collectors. 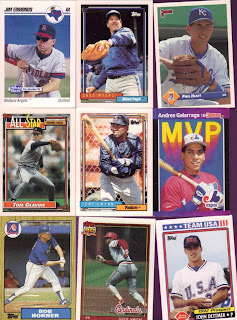 I have made some great friends through posting my random thoughts about Indians cards on here. I live in a very rural area on a farm. Let's just say there are very few collectors out here. 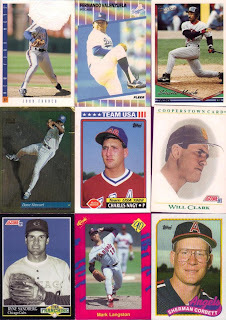 Through blogging, I have traded cards with folks 35 miles down the road and folks in England and Canada and across the United States. 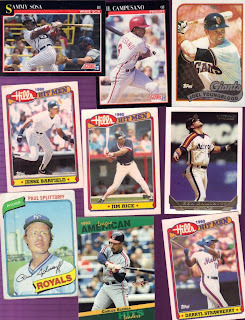 Some of those trades were actual trades, while others were cards I sent off as part of giveaways. 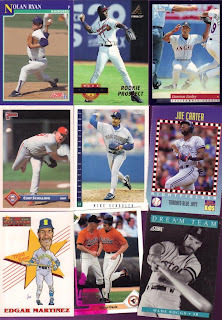 I love giving away the cards that don't fit into my collecting criteria. 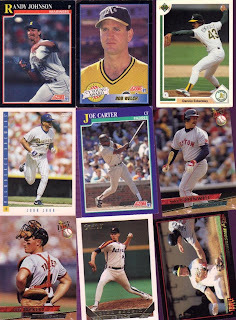 And, since my criteria is basically "Indians cards or items I don't already have," well, as you can imagine, I have a LOT of things that I end up with that don't fit. 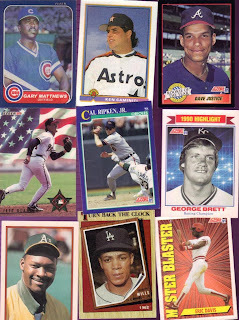 My children have only a glancing interest in baseball cards. So, what better way to share than to give the cards away? And what better way to give them away than by blogging? It's not always easy to come with a topic (which is why sometimes it's a day or three of five between posts), but in the back of my mind, I know there are things I still have yet to finish. 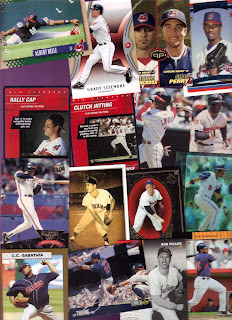 I can always post a new checklist, a new scan of cards from my collection, or a new giveaway. When I started blogging, I told myself that I would post whatever I wanted to (on here), and that I would do it for my own enjoyment. If no one comes by to read it, I would be bummed out, but I wouldn't let that stop me from blogging. And so, I blog. Did I even answer the question? I got a little sidetracked, I think. When I first read about the blog's launch, I thought it was something done to compete (though that may be too strong a word) with "A Pack A Day." 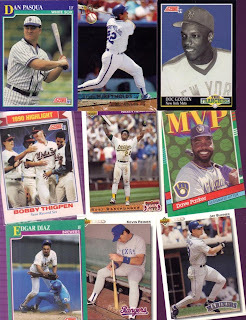 As it turns out, though, the site is actually trying to accomplish something rather monumental: Open at least one pack of EVERY kind of card ever made. "A Pack A Day" is focused more on sport-related packs, and I believe that is the right direction for that site. 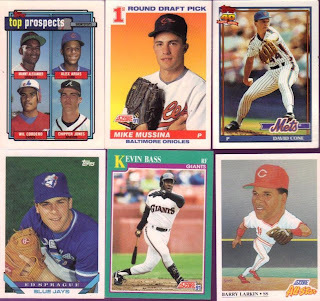 "Things Done to Cards" is mainly sports related, but with an eye for the weird things that are either done to sportscards or are done in the name of being passed off as sportscards. "A pack to be named later," however, blew the blinders off the horses and is letting them run free. No pack is off topic. Though, I would venture to say 'adult'-related packs are probably not appropriate, but that's not my call nor my place to act as any kind of censor whatsoever. In fact, I was told, "The weirder, the better!" Now, THAT'S my kind of bustin' wax! 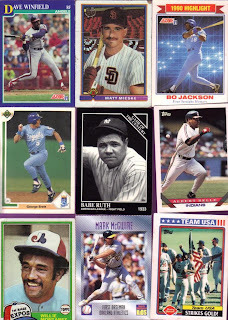 I've got my first post up and two others are already scheduled to launch for Friday and Saturday, by which time I hope to have some of my eBay oddball/non-sport packs ready and waiting. 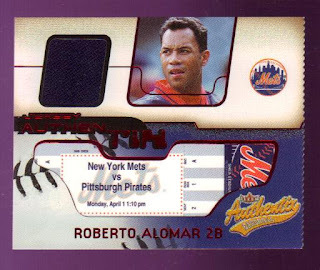 I meant to post this 'custom' card back when I was posting cards of the night game I went to in April for my birthday. Since I am eagerly awaiting cards in the mail, and since I will be out of town Thursday evening, I thought I'd throw this up there to take my mind off all the rain we've been having here in Arkansas lately! 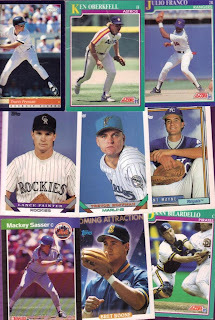 In recent posts, I have discussed two card sets which have sparked interest among several of my readers: CyberAction Digital Trading Cards and 1989 Major League Movie Cards. After doing some research, I actually located the email addresses of the original founding members of the Digibles/CyberAction card company. I wrote to all three, asking if they would participate in an interview regarding the cards, the company, and the hobby itself. I heard back from one of the individuals and through a series of emails, came -this- close to scoring an interview. As life would have it, however, things fell apart before they could come together. 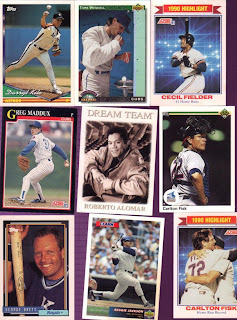 The quest for the 1989 "Major League" movie card set led me down a road of enlisting multiple 'card finding' companies for help. 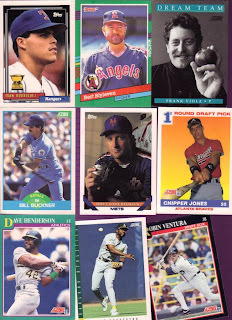 In addition, Chris Olds at Beckett (who started the quest in the first place, if you remember) has not been able to uncover specimens of the cards, either. For my part in the hunt for the cards, I contacted Paramount Pictures marketing, those card-finders, several friends in the card-collecting world, and even Dr. Beckett's contact himself. 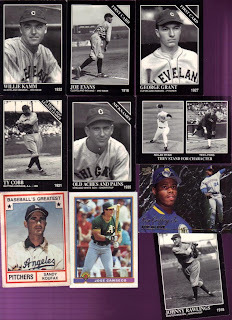 So far, the only thing I seem to have help create is a bigger demand for cards that are even more elusive than that 1952 pack of cards in a Tri-Star chase blaster! 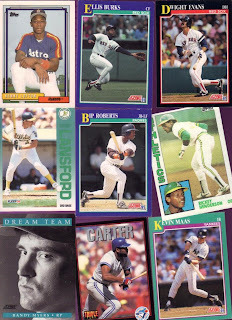 As you may have surmised, I do not go quietly into the night when it comes to cards I'm trying to find. I have not quite given up on either of these pet projects, but like many things, I have decided to set these on the back burner for a bit. Perhaps if left alone to stew in their juices, something will come along to take both of these to the next level. Some of you may be wondering why anyone would post such setbacks in the first place. Frankly, I'm not sure myself. I think in some way, I'm hoping that sticking this out here, someone will stumble along and be able to help out with either project, or by some bizarre alignment of the planets, both projects. 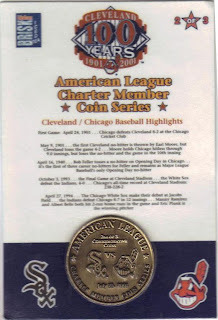 So, while I am not ready too call these 'strike-outs' just yet, I will say that things are "juuuust a bit outside...."
Xavier Nady (Yankees) - He's by himself because of the way I had laid the cards on the scanner. Each card has a trivia question on the back. His is "Who was the youngest player elected to the HOF?" Hint? He was 36 years old when elected. Another hint? He would never be confused with a spacesuit-wearing squirrel. Ready? 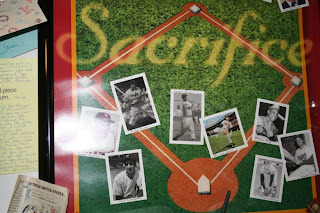 Sandy Koufax. Wow, these scans came out really small... Well, that's Nick Markakis (Orioles), Chase Utley (Phillies), and Josh Whitesell (Diamondbacks). 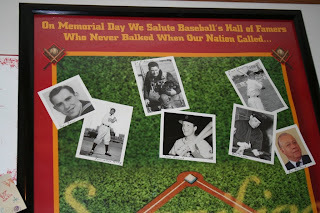 One of the trivia questions: "Who hit a home run in the first game he ever managed?" Hint? He's a former Triber. Another hint? He might have been caught singing a Simon and Garfunkel song to his wife from time to time. Ready? Frank Robinson. Ah, the Jonathon Niese (Mets) Auto Patch card. I have to admit, this is much cooler than I pictured. It's a "unique manufactured patch." Seriously? "Unique?" I'm not sure how 'unique' it is if they used the same "S" for other players, too... Ah, well. 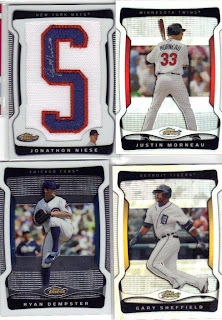 Next is the Justin Morneau (Twins) Refractor. 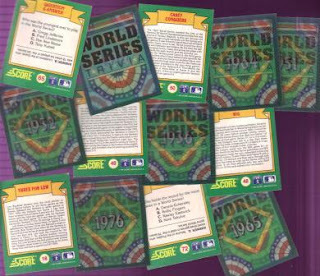 To be honest, if it didn't say "Refractor" on the back, I'm not sure I would have easily noticed the difference between the regular issues and the refractors. Ryan Dempster (Cubs) is next followed by the Gary Sheffield (Tigers) Refractor. The refractors do some cool things in the light for sure. 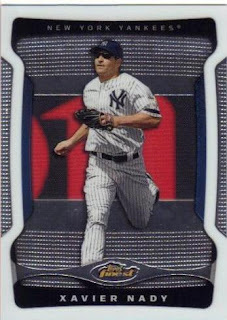 I also just noticed that the refractors have a silver border instead of the white one, so if I were rifling through a stack of them now, I'd be able to spot the refracs pretty easily. Feel better? I do. 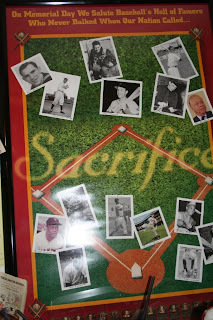 Trivia question this time: Who was the first Japanese-born player to catch in the Majors?" Each trivia question is actually multiple choice. For the sake of being my usual goofy self, however, I'm going for the straight-guess route. Hint? His name doesn't sound very Japanese. Another hint? His first name is not Ronald. Ready? Keith McDonald. Aaron Cunningham (A's), Kosuke Fukudome (Cubs), and Ken Griffey Jr (labeled as White Sox, but appearing in Mariners uniform) round out this trio. 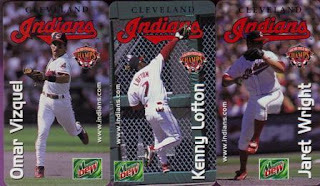 There was a discussion about cards like the Griffey over on All-Tribe Baseball. 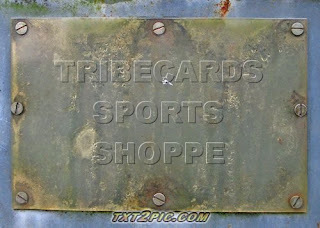 The general consensus is that card collectors hate these. Why not just go ahead and put "Mariners" at the top? Stupid. 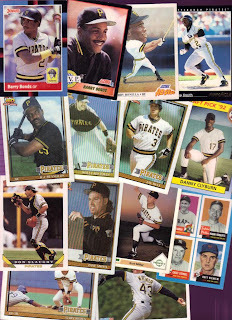 Trivia question: "Who is the only every-day player to be managed by his father in the Major Leagues?" Hint? It's not Griffey Jr. Another hint? Every-day pretty much should give this away. One more hint? He *is* a Junior. Ready? Cal Ripken, Jr. 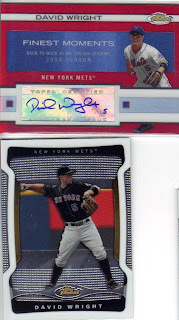 The final three cards are Adrian Gonzalez (Padres), Jose Reyes (Mets), and Joe Saunders (Angels). 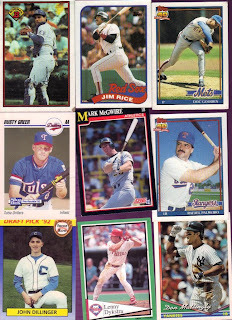 Wow, I ended up with several Mets cards out of the deal. They'll go nicely in my to-be-given-away box! 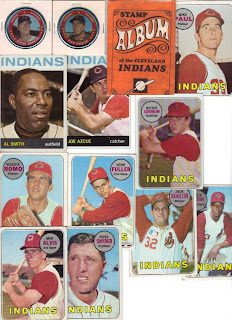 To be fair, remember, I give nearly every non-Tribe card away and then give away duplicate Indians, so very few cards are ever "safe" in my house! I have to say, I am glad I took part in this break. 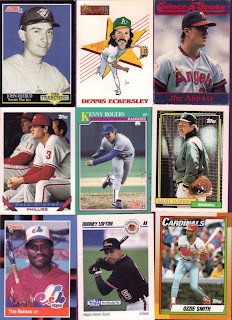 It was well worth the last-minute decision to jump in there, especially because I have a couple Wright cards that will find a very loving home! So, to address my own question regarding breaks: I say this was definitely in the FUN category.